Selecting parcels with the point buffer tool. Cedar Rapids, Iowa, the county seat for Linn County, Iowa, is a sophisticated and "wired" community with great expectations for online services. Web access to precinct and polling information, etc., is important in this politically savvy and active community. With a population of approximately 200,000 and a diverse agricultural, manufacturing, and services-based economy, demands on Linn County staff are both challenging and numerous. As a result, the county wanted to leverage its investment in GIS data by enhancing staff usage and streamlining citizen access. Linn County has two primary audiences for its GIS: county staff, who have the bandwidth and need for sophisticated analysis, and citizens, who with varying levels of connection speeds, have more limited needs for data and functionality. Given the county's small staff, it is most efficient to serve both audiences from the same data repositoryproviding full access and functionality to staff and controlled/limited access with reduced functionality to public users. Despite having a strong GIS in place, the county knew there was still a sizable constituent that was not being served. "It's all about access to data," states Linn County auditor, Linda Langenberg. "The county's goal is to provide access to thousands of users per week." Navigating to a specific user-defined scale. The county considered developing its own application but decided an off-the-shelf solution would be more appropriate given the continued product development and long-term support. 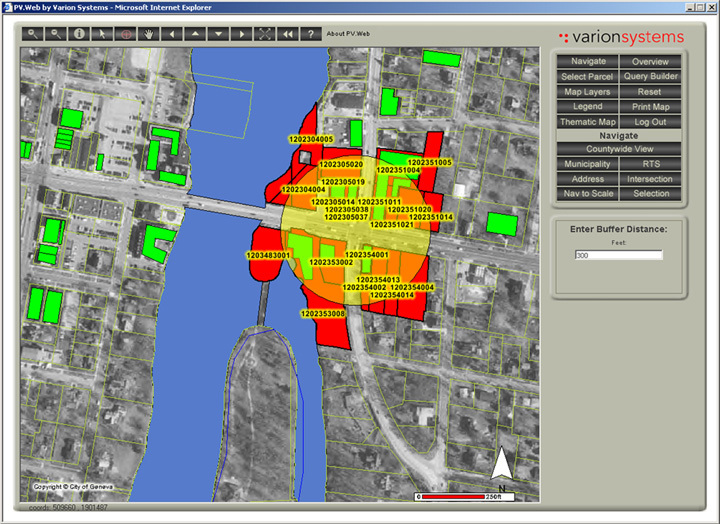 After an extensive comparison of the available software, the county selected two ArcIMS extension products from Esri Business Partner Varion Systems. PV.Web and PV.Web Public, applications built on ArcIMS 4 and Java, have helped Linn County deliver enterprise GIS, with real GIS functionality, to a wider range of audiences from a single database. These applications ensure secure access, selective access, and GIS functionality within a Web browser. PV.Web operates on an Intranet; PV.Web Public operates via the Web. According to Jason Siebrecht, Linn County's GIS coordinator, "We currently publish to approximately 2,500 unique users per week." County staff, including clerks, planners, and elected officials, access enterprise GIS data using the application's analytical tools. Citizens access a subset of the enterprise data via a browser over whatever connection is available to them. The implementation process helped the community identify unrecognized data anomalies that allowed it to scrub its data to improve the content and quality of its enterprise GIS. Now, staff can easily access spatial and tabular data. 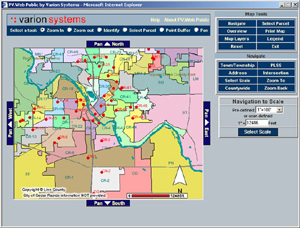 Navigation is done by a variety of methods including searches by municipality, neighborhood, tax ID, parcel number, and street intersections. It also allows users to perform thematic mapping (e.g., show all parcels within 500 feet of an intersection). "Flexibility in the technology allows our staff more in-depth analysis and mapmaking with data that may be considered sensitive," says Siebrecht. "The on-the-fly query and thematic mapping capabilities help meet most daily county business needs. The functionality helps the county deliver more with less. As we have it configured, we're able to thoroughly test our data prior to any of it being served to the Internet users." 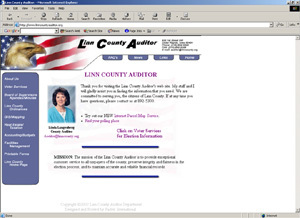 Linn County residents can now get answers online-regardless of the time or day. By simply visiting the county's Web site, residents can quickly and easily perform a property search, locate the property, and print a map. "We have had fewer constituent phone calls as a result of citizens being able to obtain the information by themselves," says Langenberg. "This frees up our technicians for other, more production-oriented work. At the same time, technical staff spend less time having to help other county departments, since they can easily get access to tools and information on the Web." Linn County auditor's Web site where its constituents can navigate, browse, query, and report on spatial and nonspatial land information. "Getting our GIS data out to the public has been one of Linn County's primary goals as the GIS data develops," adds Siebrecht. "When we launched this solution, we found it to be very efficient. One of the first days it was available to the public, we saw nearly 1,500 unique users with no real system-related delays." 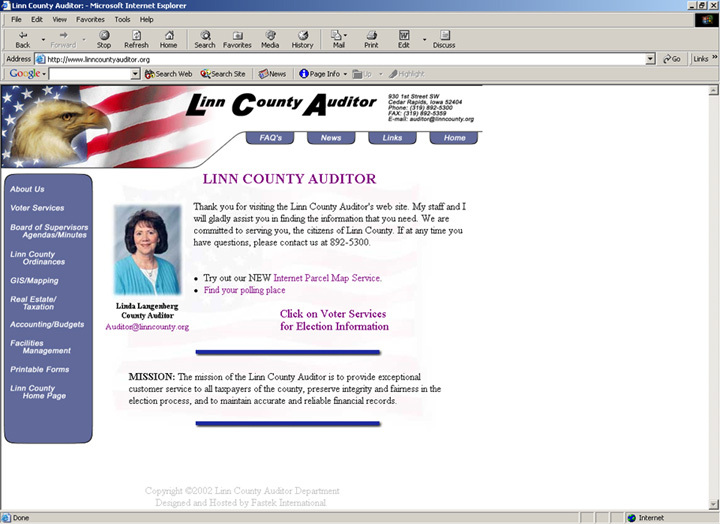 Linn County's public data can be accessed at www.linncountyauditor.org. For more information, contact Jason D. Siebrecht, GIS coordinator/database administrator, Linn County (tel. : 319-892-5300, e-mail: jason.siebrecht@linncounty.org), or Paul Braun, president, Varion Systems, a division of GeoAnalytics Inc. (tel. : 847-824-6423) or visit www.varionsystems.com and www.geoanalytics.com.